Travel woes – can computing help? Happy holidays! I’m spending my off-time in France and am currently in beautiful Nancy. Unfortunately, the trip hasn’t been entirely relaxing. Coming onto the continent, I ended up in Paris around 9pm though my original plan was to land in Lyon at noon. And even then, I’m pretty lucky — my parents have been 6 days without their luggage and I expect tens of thousands of passengers are spending the holidays in airports or alternate destinations. One of my goals in teaching computing courses at the high school level is to give students a new lens to look at daily problems through. I don’t want all of my students to go into computer science but I do want them all to be able to consider computing-based solutions in their lives and careers. believe that part of the way we can overcome some of the big problems we are facing these days — from global warming to endless political quagmire — is by having more people with a clear sense of how computing can be leveraged. In this case, plenty of strange things are going on with air transit and it’s such a complex system I can’t even begin to understand all the constraints but I do know just enough to imagine ways computing could help. What if every traveler, TSA employee and flight attendant also had some of these intuitions? I’ll start with, in my mind, the most obvious opportunity to leverage computing to ease tension in the system. My parents’ luggage was lost in Frankfurt when their plane was cancelled and they were put on a train to Paris instead. The lost luggage report they filed was also lost. The fax we sent re-reporting the lost luggage was also lost. We talked on the phone with at least 5 different people at Lufthansa baggage services and none could even enter in information to report the lost luggage — they needed that paper form, as most airlines do. We ended up having to go to the airport in person to fill out a paper form. Luckily, the information was entered but unfortunately, there’s a typo in our address so we’ll see how things turn out. Finding a fax machine, repeatedly calling the airline, going to the airport wasted a tremendous amount of our time but it also was a significant waste for Lufthansa since at least two employee-hours have gone to our case alone and ultimately the information is erroneous. It’s unacceptable that the information isn’t directly recorded in the database. At the airport, why can’t an airport employee scan the baggage tag and passport instead of needing a new piece of paper? Offering a web form would be a huge improvement over needing a fax for self-service. I’ve dug around a little bit and it turns out that a company with over 4,500 employees worldwide, SITA, specializes in software for airport and airline logistics worldwide. Interestingly, it’s owned and governed by its members including airlines and air carriers like UPS who see it as a way to centralize services to lower costs. This sounds like an absolutely wonderful idea allowing seamless integration of systems and communication between carriers. It appears that many airlines use a SITA service called WorldTracer to track lost luggage. The client-facing interface is awful — it only displays cryptic information such as “recovery process begun” and doesn’t allow for data correction. But the real problem seems to be with the agent-facing interface. I suspect that the reason people we talked to at Lufthansa were unable to tell us anything at all about our luggage is that they had read-only access to the WorldTracer database which didn’t have a record under our name since the lost baggage report had been lost. Given the information required to create a lost baggage report, it seems that the tracking system is entirely separate from the flight booking system. This seems like a real problem to me. It should be possible for an agent to quickly transfer all registered luggage information from a canceled flight into a baggage tracking system so that passengers can follow their bags from the minute they are re-routed using their claim tags. Clearly, bags are scanned periodically so the information exists somewhere. This seems like a data cross-referencing and dissemination problem. It’s not trivial but it seems like SITA is very well-positioned to address it. Their existing system seems like a step in the right direction but it’s in serious need of maintenance and update. I also suffered from some absurdities that I think could partially be addressed by better software. I had a layover in Amsterdam and missed my connection by about 10 minutes because I had to go through security which took over an hour. This seems to be a common occurrence when going through security for a connecting flight. I think the true solution involves connecting terminals so that never happens but one could alternately imagine passengers scanning their tickets when entering a security line and getting priority if they are about to miss a connecting flight, for example. When I tried to rebook a ticket on a later flight, the agent did not find any flights to Lyon that day. The agent next to him, overhearing my complaints, suggested some codes to enter to see more flights and sure enough, one showed up. All available flights should have been clearly visible. Why are agents using command-line interfaces? In a lot of cases, I find command-line more efficient than GUIs, but this is an example where I can’t believe it’s so. Imagine being able to work with 10 passenger requests at a time or do a side-by-side comparison of different options. 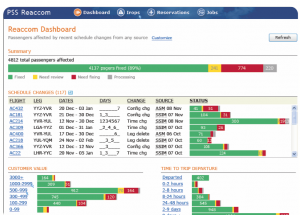 How much of an efficiency change can be triggered by a change in interface for re-booking agents in airports? Is there HCI research on this? A cancelled flight should result in an attempt to automatically re-assign passengers. Priority should be automatically determined — by last name, by value to the airline, whatever, but not by pushiness. Passengers should immediately be told where to sit and how long to expect to wait. I’m a big fan of ITA Software, which Google would like to acquire. Their products power most popular airline booking systems including Kayak and FareCast and have provided incredibly rich information about flight popularities and so on. I poked around a bit and found the screenshot at left which nearly made me weep with joy (taken from their baggage management brochure). This is exactly what I had in mind, only better. 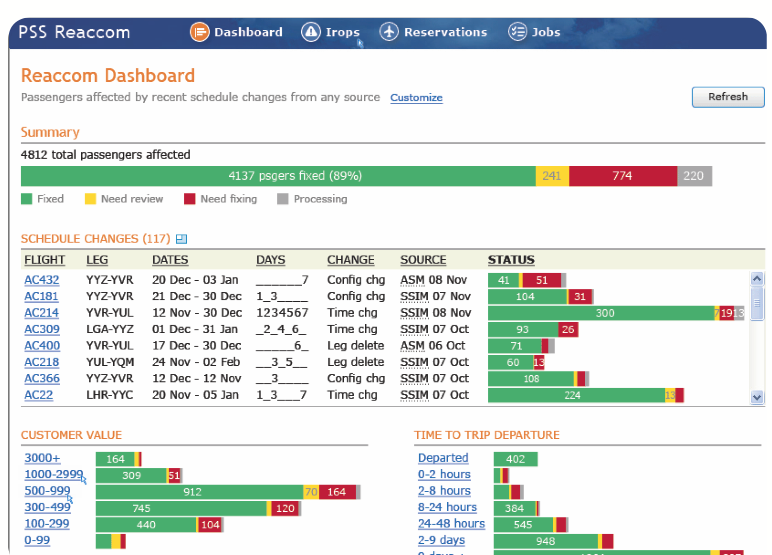 Another screenshot shows all passengers from a flight and automatically-suggested alternate accommodations. Why don’t agents use this? It may be expensive software, but I just can’t believe that it would be any more expensive than tens of thousands of passengers having to wait for hours in line, lose their luggage and be put in hotels. Perhaps most alarming is that at one point, we were told the plane we were supposed to get on was 10 minutes away. Half an hour later, we were told that the plane had, for some unknown reason, landed in Stuttgart instead of Amsterdam. The gate agents truly had no idea where the plane was and when/if we had any chance of leaving. I imagine KLM probably has a general idea of where its planes are most of the time. Why is that information not available to gate agents and customers? Air travel involves complex logistics which means software could have a significant streamlining effect in that domain. Though there clearly is already great software running behind the scenes (after all, most planes land in the right country at the right time with the right bags), some systems leave a lot to be desired. I think that if both passengers and employees were more aware of how software works and what it enables, we would see accelerated systemic improvement. For example, gate agents certainly don’t enjoy spending 7 minutes each with angry passengers to try to accommodate them and if they understood that there were alternatives, they might be able to put pressure on their employers. If my students can be similarly thoughtful about areas where software can make a difference, then I feel like I’m doing my job. Maybe this is the elusive ‘computational thinking’ that we want all educated members of society to be capable of? Everything boils down to a UI problem, n’est pas? You must have had a lot of time in airports with your laptop to ponder and write this! Yes, it was a lot of time in airports! I think it’s primarily a data storage and representation problem. Who owns the databases? How is information synchronized? What’s in one table vs. another? I’m also very interested in the UI considerations. Seems like a practical context for HCI research and I’m surprised I can’t find anything through naive web searches. What joy. I was once on the commercial side of writing software. To write software that will satisfy that broad a range of customers (all airlines) is impossible. Too many commitees and studies. Upgrading software would require the French and Italians to agree on something. Ain’t going to happen. One of them is bound to be on strike or vacation. For a real adventure fly Aeroflot to central Asia. The lady in the next seat had a carry-on that included a live chicken. It seems like the airlines could write or have written better front ends to deal with backend databases. Like you I have wondered why systems did not automatically handle rebooking and schedule changes when the system was disrupted. It would make things so much easier for everyone. But I think also that one problem is the lack of good development methodologies for large complex systems. This makes the investment so large that it becomes unaffordable. That is something the current and next generation of developers really has to work on.